We have great pleasure in presenting to our readers the Indian edition of Yoga for Beginners by Swami Gnaneswarananda. Karma Yoga - Perfection through work. Bhakti Yoga - Perfection through Love. Raja Yoga - Perfection through meditation. Jnana Yoga - Perfection through knowledge. We are sure that the readers will find the book eminently helpful in their spiritual practice. Originally, these lectures appeared serially in the pages of the Vedanta Kesari published by this math. Later they were brought out in book form by the Vivekananda Vedanta Society of Chicago. We are grateful to the Society for permission to bring out this Indian Edition. As the title indicates, this book is primarily intended for beginners in spiritual life. However, those who are well along the road to spiritual achievement will also find much encouragement the spoken words of Swami Gnaneswarananda as they were taken down, mostly stenographically, by three of his students, Virginia Knapik, Genevieve Spoonholtz, and myself over a period of some years. In a compilation of this sort there are bound to be some repetitions and reiterations. But I think that these enhance rather than detract from the book’s value. The subjects discussed require a great deal of attention on the part of the reader, Repetition of an idea is, therefore, very helpful. A good teacher will naturally repeat and explain in different ways the subject of discussion, in order to better reach the mind of the student. Swami Gnaneswarananda’s yoga classes were held Tuesday evenings on the premises of the Vedanta Society of Chicago, then located at 120 East Delaware Place. 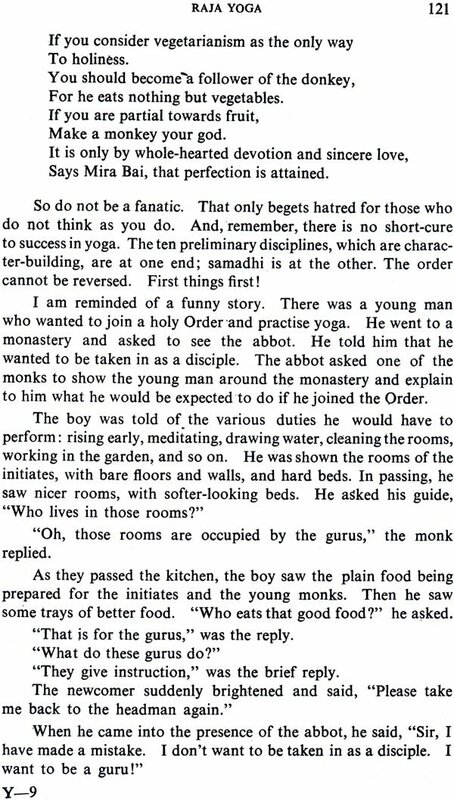 The Swami would give his talks seated at a small table, with the students sitting around him. This made the classes very informal. The Swami spoke extemporaneously, introducing many lively stories and anecdotes to bring out his points and to enliven discussion. He was thus able to put before his students the highest religious and philosophical teachings of the Hindu religion in a language and idiom they could really understand. To paraphrase Swami Vivekananda, he could take a person from wherever he stood and lift him up. One did not have to have high academic qualifications in order to understand Swami Gnaneswarananda. The Swami’s manner of teaching, in fact, was so simple that it was only after some reflection that one could fully appreciate its depth. One of the Swami’s strongest convictions was that knowledge does not come from outside us. It is an unfoldment from within. The duty of the teacher in any field of knowledge, he would say, was to stimulate the mind of the student and help him to remove the inner obstructions to the perfect unfoldment or realization of that knowledge. Swami Gnaneswarananda was a person of great charm, with a magnetic personality. He had a boyish nature, with a smile for everyone and an enthusiasm for spiritual endeavour that was contagious. He was equally at home discussing the intricacies of philosophy with the elders or telling stories of the saints and sages to small children, fascinating them with his tales. Two qualities seemed most prominent in his nature: a spiritual love that enveloped all beings in the universe; and a dynamic approach to, and understanding of, the problems that aspirants in spiritual life have to cope with. “The clearest and most open thing in the world,” the Swami once said, “is the means to attain divine life; but because of our passions and weaknesses we have covered that up with all sorts of ‘secret knowledge’ and lots of other nonsense. The ‘open sesame’ to spiritual life is the secret of being and becoming, of having the strength and courage to carry a thing into actual practice, no matter how simple and devoid of high-sounding and befooling names it may be. This is the ‘open secret’ knowing which we can wake up from this long and painful wond-dream. There is no short-cut to that. “Truth is always simple. It is only falsehood that is intricate and complicated. Spirituality is simplicity. I find that many people are interested in yoga, particularly Saja Yoga. But most of them have a very odd conception of what it really is. Many think that it is something magical, like Aladdin’s lamp, something that can bring them, without the least trouble, all the things they with to enjoy. They learn a couple of postures and a few peculiar ways of breathing and right away they become Aladdins of the twentieth century, even without a lamp! To others it appeals as the builder of perfect health and enduring beauty. Do whatever you like, live any way you please, only learn some yogic tricks and then you are free from indigestion, headache and overweight. And lo! Look into your mirror and see what magic charm your features radiate. 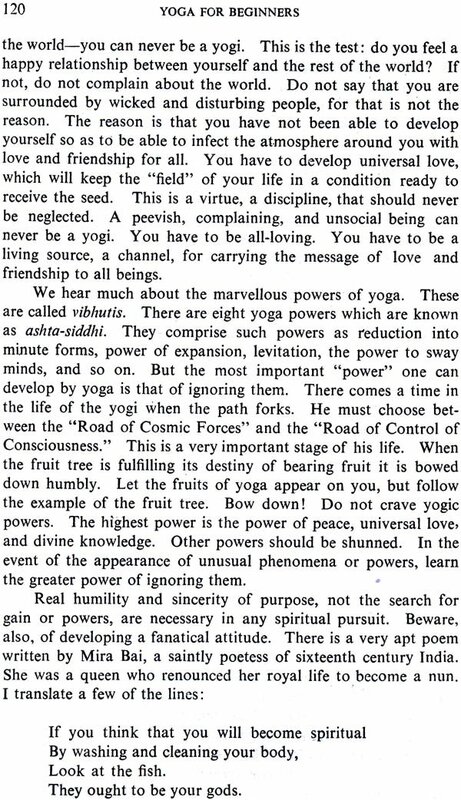 Every effort has been made to weave these notes, sometimes taken down at random, into a whole that is both comprehensive and representative of the Swami’s Yoga classes. It is hoped that this little book will reach the hearts of sincere aspirants in spiritual life and that in it they will find much to ponder over and much to enjoy. The search for spiritual perfection should be accompanied by joy, even laughter, and not by a morose, “sackcloth and ashes” attitude! The compiler wishes to acknowledge with gratitude the permission given by the Vedanta Kesari, Madras, India, to reproduce these notes in their present form. They first appeared in that magazine in serial form from November, 1967, through May, 1971. Begin the day with raja yoga. Prayer and meditation will give you an undercurrent of poise like the lingering sound of a bell. Be a bhakta in your contact with other. See God in everything and offer worship to Him.. In the field of action be a karma yogi. Work for the sake of work. Let your work be your worship. Last but not least, let your life be balanced and controlled by the intellect. Knowledge of fundamental principles gives you latitude and the power of adjustment. 1. Each soul is potentially divine. 2. The goal is to manifest this divinity within, by controlling nature-external and internal. 3. Do this either by work, or worship, or psychic control, or philosophy, by one, or more, or all of these-and be free. "This is the whole of religion," added Swami Vivekananda. "Doctrines, or dogmas, or rituals, or books, or temples, or forms, are but secondary details." Let us consider these statements as three propositions. PROPOSITION 1: Each soul is potentially divine. What is meant by the term, "divinity"? Most people have a very vague notion about this. Divinity is an existence which is infinite, immortal, imperishable; absolute, all-knowing, all- powerful, and ever-blissful. The word, divinity, therefore, implies the state of (1) absolute existence, (2) unlimited power, (3) infinite knowledge, and (4) eternal bliss. Any conception of divinity, of God, or of an ultimate state or being, must include these attributes. Such a divinity, God, ultimate state or being must be perfect, and in order to be perfect it must be of the nature we have just described. Divine perfection is uncaused, unlimited, and un-conditioned by time, space, or causation. In relation to man what do I mean by divinity? I mean that highest ideal of perfection which we all want to attain in the course of our lives. I mean the unfoldment of that state of con- sciousness in which we will have no defect, misery, suffering, or limitation of any kind. Spontaneously, knowingly or unknowingly, we all respond to an urge for that. What are we all working for? What is our highest goal in life? In short, we are all working for the attainment of the ideal state of perfection, for the attainment of limitless existence, absolute knowledge, and infinite happiness. We want to live. And we want to live in such a way that there will not be any suffering, disease, death, or an imperfection of any kind disturbing our existence. We want to know. We spontaneously feel that we have a right to attain a state where there will not be anything in this universe unknown to us. We are all looking for that state of realization. Our discoveries, inventions, and all the advancement of intellectual thought and scientific progress have been possible owing to that inner urge in man. We spontaneously feel that we have a right to be happy. Of course, the philosophy underlying the ideal and the method for the attainment of that state of bliss might be different with different individuals. But, so far as the fundamental urge is concerned, it is one and the same for everyone. The motive force behind every living being is a similar funda- mental urge for the unfoldmeut of the state of perfect existence, knowledge, and bliss. We do not have to be taught about this state of divinity, for it is not without; it is always within. Can you find any living being who does not like to live? Can you find a man who has honestly become reconciled to disease and death? Where is the person who is satisfied with the state of imperfection? Can we become recondled to ignorance? Why this insatiable yearning for more and more knowledge? There is no' human being who does not feel a deep sense of protest against the state of ignorance. Tell a human being that he has no right to know, and see how insulted he feels. Why such sensitiveness? What about happiness? There are people who have been suffering all their lives. But were they reconciled to their state of misery? Were they not always looking for that "silver lining" to the dark cloud of their suffering, either in this life or in a life here- after? This shows that in man's inner nature there is a firm con- viction that he has the right to be happy. Man's instinctive protest against imperfection of any kind- against death, ignorance, suffering, and so on-presupposes that he is born with the unshakable conviction that infinite perfection is his birthright. That man is divine is shown by his response to this conviction and his resentment towards the contrary, spontaneously and intuitively. The subjective ideal of perfection, of divinity, has been con- cretized and objectified in the form of a personal conception of divinity, or God. If you speak to people about God being possessed of these divine attributes-absolute existence, know- ledge, and bliss-they will agree. But when you speak of their inner divinity they often seem shocked. Analyze your conception of God and you will find that it is nothing but the concretized picture of the fulfillment of absolute existence, knowledge, and bliss. God does not become old or sick; he does not die. He knows everything; there is no limitation to his knowledge. God has the capacity for the enjoyment of infinite bliss. Nothing can make him sad or depressed. These are the three basic subjective ideals that have been concretized, objectified, and developed into the conception of an objective deity. Why is it that most of you are ready to agree that these ideals describe God, or an ultimate being or state, but are not so ready to agree that these may be ascribed to the nature of man also? Why do you hesitate to believe that man is potentially divine? First of all let me ask you that if divinity is infinite, which it must be, will it not pervade everything? Will there be any place where it is not? Could there be anything else besides divinity? No. Because if there were, the infinite would not be infinite. Infinite implies the existence of one only. The existence of anything else would limit it and it would lose its infinite nature. There are three sources of knowledge, or means by which truth may be verified: authority, inference, and direct perception. Let us consider these. AUTHORITY. This means reliable authority, from persons who have realized the truth themselves, or from scriptures or other records of those who have realized the truth. Ninety percent Of all our knowledge is gained from this source. For instance, we say we know and we accept as true many scientific facts. But have we, ourselves, experimented and proved them? We have not. We accepted the authority of those who have experimented and reached certain conclusions which they have proved to themselves to be true. We may, in the same way. accept the findings of those in authority in spiritual matters if they have experimented and gained direct perception of the truth. This should satisfy the most scientific "modern. " a) Change presupposes the existence of the Unchangeable. In order for change to be recognized it must be observed by someone who is, relatively, less changing. The subject, S, sees the object, A, changing into A-I, A-2, A-3, A-4, and so on (the figures represent- ing time). If the subject, S, were not relatively less changing than the object, no change in the object could be discerned. However, the subject, S, may be observed by another subject which watches S as a changing object. If we were to continue this analysis ad infinitum, directing our attention first to the object and then to the subject, we would find the same process operating. There- fore, we must admit that there is, ultimately, one which is constant, in order for change to be recognized at all. That which is changeless is eternal, infinite. Where is there any other to work change upon it? The changeless is perfect and, therefore, divine. You cannot logically impute change to divinity.